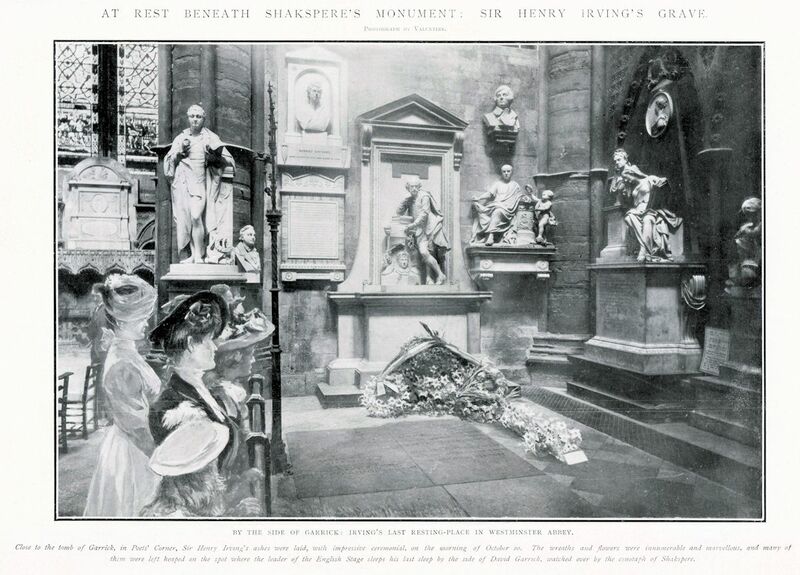 Photo by Valentine, ‘At Rest Beneath Shakspere’s Monument: Sir Henry Irving’s Grave (1905). 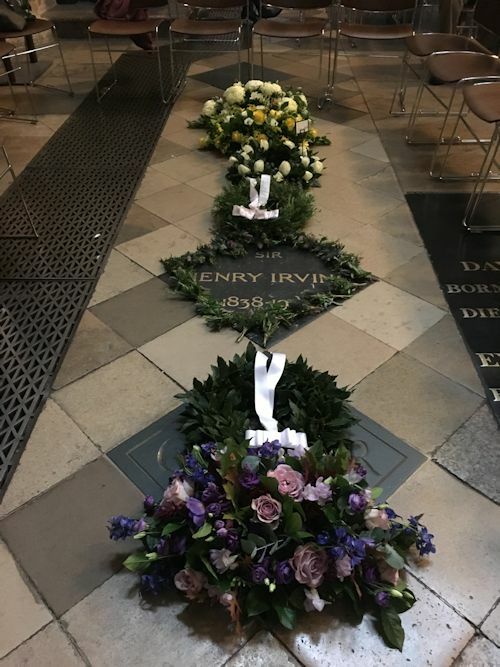 A service of commemoration was held at Westminster Abbey on the morning of Saturday 27th October 2018 to mark (though a week late) the 113th anniversary of the interment of Sir Henry Irving’s ashes on 20th October 1905. There, at his graveside, close by the Abbey cloisters and the door of St Faith’s Chapel, the Archdeacon of Westminster, the Venerable David Stanton, conducted a simple and most affecting service of prayer and thanksgiving in honour of the man who in the nineteenth century did more than anyone else to improve the quality of dramatic production and the reputation of the theatrical profession as a whole. Irving was widely recognised as its leader after 1878 when he took over the management of the Lyceum Theatre in the West End of London, and remained so at the time of his death, which was mourned by thousands in the United States and Canada – where he, Ellen Terry and the Lyceum company toured his productions on eight occasions between 1883 and 1904 – as well as by all classes of people at home. He pioneered techniques of stage lighting and the dramatically integrated use of orchestral music, and was responsible for advances in stage management and scenic design, besides being a wonderful actor of both comedy and tragedy – the greatest, it was said, since David Garrick over a hundred years before. Born in poverty in a rural village and struggling long for recognition and respect among the lower ranks of the acting profession, Irving was acquainted with hardship and despair in some of its harshest forms, especially as a young man, and vowed to alleviate the sufferings of those he found in a similar plight to himself if ever he were to rise to a position where that would be possible. Together with some of his friends he set up the Actors’ Benevolent Fund in 1882 and at the Lyceum created a pension scheme for the benefit of his employees. That fund he kept subsidising from his own pocket, leaving him virtually penniless after a lifetime of effort to improve the wellbeing of his fellow men and women. He was asked why he had not seized the opportunity to enrich himself at the expense of his art and his workforce. “I was not brought into the world to collect money,” he said. Put plainly, Henry Irving was an exceptional person. His private character stood high in the regard of his fellow workers, male and female – his comrades, as he called them – and the public thrilled to his artistry wherever he went. In time, the monarch knighted him, the first player to be so honoured, and the Abbey buried him. Irving in the twentieth century was only the second actor, after Garrick in the eighteenth, to be admitted to the national pantheon. The recent commemoration of that solemn occasion was organised by the Irving Society, thanks to Dr Kristan Tetens, its Honorary Treasurer, whose control of the entire event in outline and in detail was a masterpiece of imagination and good judgment, assisted by Sir Henry’s great-great-great-granddaughter, Imogen Irving, in tandem with the Abbey authorities and the Irving Society’s Chair, Frances Hughes. Both Kristan and Frances are members of the Society for Theatre Research. The Abbey could not have been more helpful to the Irving Society or more accommodating. The floor of Poets’ Corner surrounding Irving’s grave became an open stage with seats on three sides for more than 80 people, including 20 from the Irving family, a dozen of whom had travelled from Canada specially to be there. Actors, scholars, friends and members of the Irving Society took their places alongside the family, filling Poets’ Corner. Irving’s own crucifix, beautifully crafted in ivory and dating from the seventeenth century, was visible throughout the proceedings. It was given to the Abbey after his death. Now it belongs in the Abbot’s Pew (not open to the public), and the Irving Society was extremely grateful to the Dean and Chapter for so graciously honouring the whole assembly with its powerful presence. The Archdeacon, in welcoming everyone to the Abbey, called upon his congregation to pray for all actors, technicians and creative people whose vocation is the performing arts, that they might be inspired by Irving’s example. David Mayer stepped forward to give the Address, emphasizing most vividly the individuality of Sir Henry’s extraordinary personality and his mesmeric presence on stage. David, who is a great authority on Irving and the theatre of his time, is a longstanding member of the STR and Emeritus Professor of Drama at the University of Manchester. There followed a sequence of readings associated with aspects of Irving’s life and work, commencing with ‘Henry Irving’, a poem by one of his admirers in the United States, the theatre critic William Winter, which was read by Frances Hughes on behalf of the Irving Society. Then Imogen Irving, on behalf of the family, read an extract from a speech her great ancestor gave in 1887 on the subject of Shakespeare, which she followed with a passage from act four of The Tempest. Next, Jasper Britton was absolutely compelling in a speech of Shylock’s from the first act of The Merchant of Venice, a role and a play that brought Irving huge success for several years in a production of his own staging. Dame Penelope Keith evoked to perfection his lifelong love of the English countryside in her recitation of John Clare’s poem ‘On a Lane in Spring’. Finally, your humble reporter, who was also the master of ceremonies, read on behalf of the scholars of Victorian theatre Tennyson’s ‘Crossing the Bar’, a poem that had been heard in a choral setting during Sir Henry’s funeral. An incomparable experience it certainly was to be speaking those words while standing between the graves of Irving and Garrick, and close to that of Tennyson himself, who was doubtless cocking an ear. Six wreaths, in silent ritual, were then placed close to Sir Henry’s grave. The first was laid on behalf of the Irving Society by committee member Jennie Bisset. The next, on behalf of the family, by Harry Irving MBE, great-great-grandson of Sir Henry. On behalf of the family of Dame Ellen Terry, who acted with Sir Henry at the Lyceum Theatre for 24 years, another was laid by Ellen Terry Craig, great-granddaughter of Ellen Terry and the Patron of the Irving Society. Simon Jones laid a wreath on behalf of the acting profession. One on behalf of the Garrick Club, to which Irving belonged for 31 years, was placed by David Mayer, a distinguished member himself; and then, on behalf of the Actors’ Benevolent Fund, the last wreath was laid by its President, Dame Penelope Keith. Small posies of thistle, rosemary and mint in memory of Sir Henry had been presented to all on arrival, and, tenderly, when the ceremony was over, many people were moved to place them at the edge of the stone itself in private tribute. The solemnity of the proceedings was eased now and then by gentle humour and good laughter, and the Archdeacon played his part in that with perfect grace. After a while, I saw that our number had grown somewhat, with strangers who were visiting the Abbey pausing for a while at the perimeter of our seated area, and standing there rapt, drawn towards our makeshift theatre by the sound of voices sending their poetic ecstasies high into the echo-chamber that is Poets’ Corner and wanting to hear more. Quite a crowd developed, and when they recited the Lord’s Prayer in unison with us, it was as though, suddenly, the whole Abbey was gathered into one compartment of the vast temple, intensifying our tribute to Irving himself and swelling the scene. The Archdeacon, watchfully catching the mood, turned to give God’s Blessing to his extended congregation beyond the barrier as well as to those within. How Irving would have loved that. The published order of service, compiled by Dr Kristan Tetens and Archdeacon Stanton, was beautifully produced and most sumptuously illustrated with more than 20 images of Irving’s life both on and off the stage. Now it is the souvenir of a remarkable day. Immediately following, a group of guests braved the cold air outside the Abbey to join Frances Hughes on a short walk to Cowley Street to see the new English Heritage Blue Plaque marking the residence for 31 years of Sir John Gielgud, who was himself a Terry on his mother’s side (the great-nephew of Ellen Terry) and the Founder Patron of the Irving Society. There, on the pavement of the little Georgian street, Frances treated everyone to a captivating talk, full of flair and tremendous knowledge. Thence it was to the Cellarium Café and Terrace in Dean’s Yard, Westminster, for a very good lunch, more good company and for all the Irvings a precious family reunion. “How deep the genes may leave their marks across the generations,” mused Professor Mayer in his Address, seeing in the younger Irvings a fresh imprint of the ancestor we had come to honour. In feature and form, in style and physique, in courage and imagination, the Antique (as he was known to his sons) has not disappeared from our lives. His legacy is everywhere, whether we see it or not. Anyone who assumes that Henry Irving is irrelevant to the performing arts today or the modern world cannot have been in Poets’ Corner on the morning of 27th October 2018.